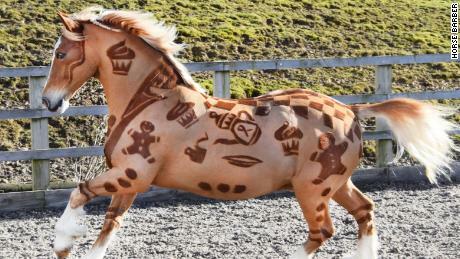 Dubbed the “Horse Barber,” the design graduate has set up her own business clipping creative artwork into the hair of horses. Her much loved pet suffered from Cushings disease –meaning its coat didn’t shed properly — so she would spend her time tending to it out of necessity. “I had never done it before but I’ve got the attitude of just saying yes and worrying later. So we did it and she put it online,” Hames said, in a phone interview from her home in Greater Manchester, England. Having set up the business six years ago, her work was eventually scouted by a clipping company in America — Andis — who invited her to showcase her skills and help train others. “It’s been an incredible journey, it’s gone further than I ever thought it would,” she said. Last November, Hames was invited to create a design to mark the armistice centenary — 100 years since the end of World War I — an honor she didn’t treat lightly. “I spent about six weeks on that project,” she said. In March 2018, she did a charity clip for MacMillan Cancer Support. The “Gingerbread Horse'” was created in memory of a close friend that had passed away. Most of Hames’ business comes from individual requests, with people coming to her with a design already in mind — this sometimes throws up strange and difficult requests. “It might sound a bit odd but one girl asked me if she could have chains on her horses hind haunches,” she revealed. Hames is confident her work is entirely safe and holds the horses’ well-being at the forefront of her work. She believes the stigma around artistic clipping is borne from a lack of understanding. “A lot of people who speak negatively about it don’t actually realize that the horses they see on TV are normally clipped.” she said, referring to racehorses.